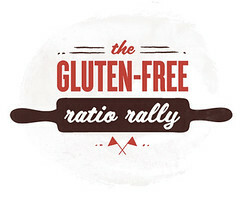 Welcome to month six of the Gluten-Free Ratio Rally! If you’ve stumbled upon this post and are interested in reading more about what the Rally is all about, check out the post from our inaugural run when we all shared ratios and recipes for pancakes. This month we’re sharing our recipes and ratios for white or yellow cake. I find inspiration for recipes everywhere—food magazines, blogs, the market, dining out at restaurants—but I’m going to be up front here and tell you that this idea came directly from my husband. Several weeks ago, we were on an ice cream run and noticed that Ben & Jerry’s makes a Boston Cream Pie flavor. Chris almost grabbed a pint, but was afraid that it wouldn’t taste quite enough like its namesake and that he’d find himself disappointed. Ice cream may make you feel guilty, but it shouldn’t be a source of disappointment. 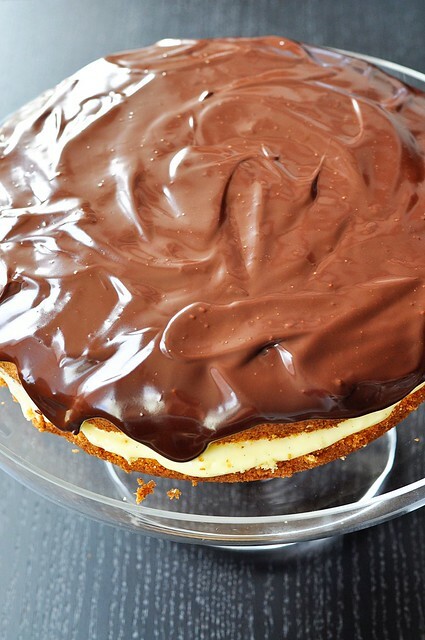 “You should make a gluten-free Boston cream pie,” he mused as he reached for something else. A great idea. I filed it away. 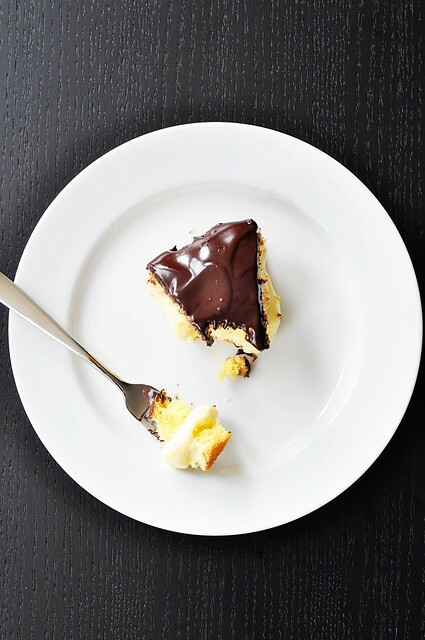 The easy-to-remember ratio makes cake into such a simple project, and Boston cream pie is a slick way to dress it up. Split it in half, fill it with pastry cream, and spread some chocolate over the top. Cake, cream, chocolate. Whoever thought this one up deserves a gold star. Ruhlman does note that the amount of butter can be variable, which is a good thing. The first time I made this yellow cake (the difference from white cake, we’ve determined, being that yellow contains whole eggs while white is whites only), it came out super moist and insanely buttery. It was fantastic entirely on its own, so rich and buttery…and…buttery. I knew right away, however, that the flavor of the cake when made with that full amount of butter, while delicious, would totally overpower the cream filling–and what’s the point of filling something with cream if you can’t even taste it? So I made the cake again, using 6 ounces of butter instead of 8 (if I were a big food company, this is where I would pat myself on the back and advertise it as having 25% less fat than the original). It had a slightly drier crumb, not to its detriment, and a much milder butter flavor. In hindsight, I suppose I could have replaced some of the butter with oil to tone down the taste, but this worked just as well. And Ruhlman said it was okay. The final product was a (less) buttery yellow cake with a beautiful crumb, slathered through the middle with vanilla bean-flecked pastry cream, and topped with a bittersweet chocolate ganache. Prior to working on this recipe, my only experience with Boston cream pie had been the donut variant. Good, but definitely not this. How we made it last several days, I’ll never know. Especially considering that–did you hear?–it has 25% less fat. The filling in this cake is a standard pastry cream. You could replace it with vanilla pudding if that feels easier to you, but once you’ve made pastry cream, you’ll be dying to make it again. The way it comes together sort of feels like magic. To make your life easier, I suggest making it a day or two ahead. And for the chocolate icing, feel free to use whatever chocolate you prefer. Default to semisweet, but if you know you like it dark I can tell you firsthand that bittersweet is pretty darned good. Make the Cream Filling: Split the vanilla bean and scrape out the seeds. In a small saucepan, combine the milk, half the sugar, the vanilla bean and the seeds (if using extract instead, hold off), and a solid pinch of Kosher salt. Whisk the egg yolks, the remaining sugar, and the cornstarch together in a small bowl until smooth. Place the saucepan over medium heat and bring the milk mixture to a simmer, stirring often. Once it reaches a simmer, strain the milk through a sieve to remove the vanilla bean any debris it may have given off. Return milk to the pan over medium heat. Set the bowl with the yolk mixture on the counter next to the stove; if it slides around on the counter, twist a dishtowel, shape it into a ring, and set it beneath the bowl to steady it. With one hand, start whisking the egg yolk mixture. Use your free hand to carefully ladle the hot milk into the yolk mixture, whisking rapidly all the while to keep from cooking the eggs. Incorporate a few ladlefuls of milk into the yolks and then pour the mixture into the saucepan with the remaining milk, whisking quickly to incorporate. Cook the mixture for another minute or two, whisking constantly, until it becomes thick. 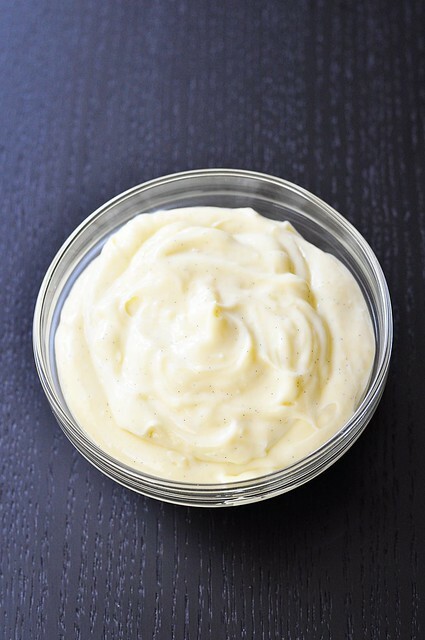 Transfer the cream to a medium bowl and whisk in the cold butter (if using vanilla extract, add that now as well) until fully incorporated and the cream is smooth. Place a piece of plastic wrap directly on the surface of the pastry cream to keep it from forming a skin and transfer to the refrigerator. Allow to cool completely. Can be made up to two days ahead. Make the Cake: Preheat the oven to 350 degrees. Grease the bottom only of an 8 or 9-inch round cake pan. In a small bowl, whisk together the millet, brown rice and tapioca flours, the potato starch, xanthan gum, and baking powder. In the bowl of a stand mixer fitted with the whip attachment (or in a large bowl, with a hand mixer at the ready), combine the eggs, sugar, salt, and vanilla extract. Beat on low to combine the ingredients, then increase the speed to high. Beat until the mixture is pale yellow, has tripled in volume, and falls away from the whip in a thick ribbon. Fold the flour mixture into the egg mixture. Fold in the melted butter until thoroughly combined. Pour the batter into the prepared cake pan. Bake for 35 minutes, until golden brown and a toothpick inserted into the center comes out clean. Allow to cool completely in the pan. Make the Icing: Place the chocolate in a small bowl. Heat the milk in a saucepan over medium heat or at 20 second intervals in the microwave until hot, but not boiling. Pour the hot milk over the chocolate and whisk or stir with a fork until the chocolate has melted and the icing is smooth. 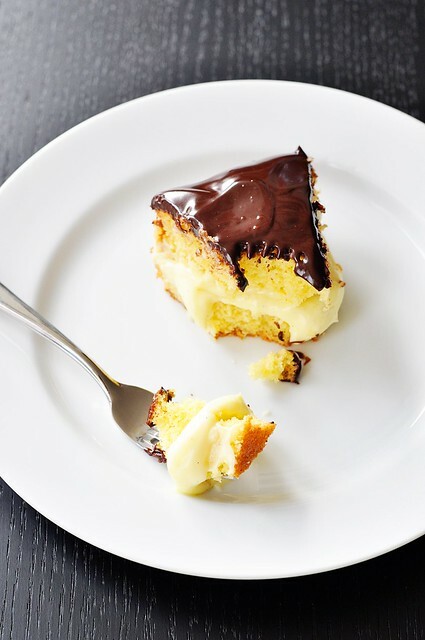 Assemble the Boston Cream Pie: Run a thin knife around the sides of the cake to release it from the pan. Turn it out onto a cake plate. 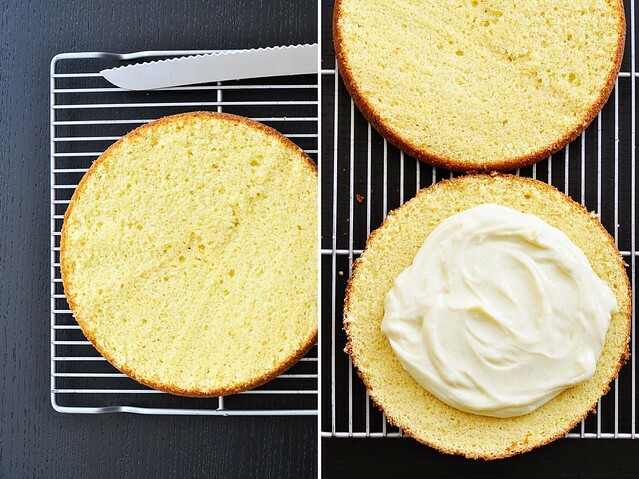 Using a long knife, cut the cake in half from the side so that you have two layers. Carefully lift off the top layer of the cake and set it aside. Stir the chilled pastry cream until smooth and workable, if needed. Spoon it into the middle of the bottom layer of the cake and spread it out evenly, to within a half inch of the edge. Gently pick up the top of the cake and place it atop the cream filling, pressing lightly to secure. Pour the chocolate icing on top of the cake. Spread just to the edge, letting it ooze over and drip down the sides in some places. Store leftover cake in the refrigerator. I know you know this already, but cake is pretty much my favorite dessert. Of course, that means this is a dangerous rally for me, especially with such talented and creative bakers in the mix. There has been so much cake in our kitchen lately, but this month’s Ratio Rally recipes are going to have me preheating the oven before I even realize what I’m doing. Our lovely host Kate over at Gluten Free Gobsmacked has the full list. Be sure to check them out if you too enjoy stuffing your cake-hole. I do love stuffing my cake-hole. This looks terrific! This is truly stunning! That pastry cream looks TOO good, though. Love your blog btw! Love the flecks of vanilla in the pastry cream. Looks heavenly! Nomnomnom! I could eat Boston Cream Pie all day. I bet that cake was buttery, but light at the same time. 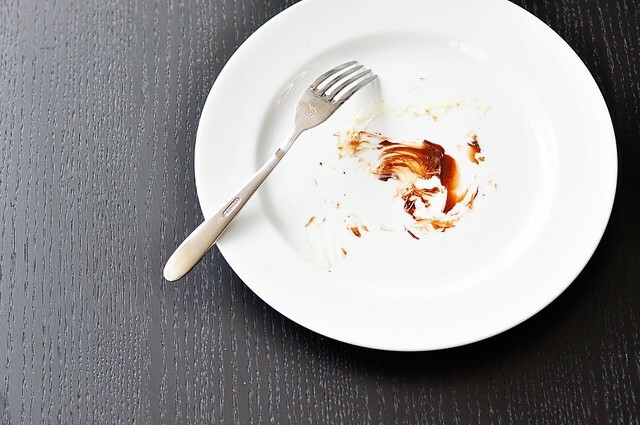 I was sad that it was all gone in the last photo – I would like a piece, please! you and your husband have brilliant ideas! really though… what’s better than cake, pudding AND chocolate? anyone? your looks amazingly delicious! This looks like a keeper–can’t wait to try it–it has all that I love in one decadent cake! Ah, now I know that I don’t really have a white cake! What a great concept. I am filing away the pastry cream. This looks like a great yellow cake! I like your flour combination, and the photos here are brilliant. I’ve just come across your blog, and glad to have found it:) I was in NY last year (I’m from Australia) and look forward to looking through your other posts and getting all nostalgic/travel bug for New York again! I. Love. Boston Cream Pie! I WILL be trying your recipe – the last time I made Boston Cream Pie GF from a recipe in a magazine, it turned out a cake with an insanely dry crumb. Yours looks amazing. I can’t wait! oh my word – look at the deliciousness that you’ve posted! how did you stop yourself from eating the whole thing in one go?? Cna’t wait to try it, never thought of pastry cream to fill a cake with – yum! I found your website through this month’s ratio rally posts. It is serendipitous, because I am actually in need of a good, yellow ‘birthday cake’ for a party next weekend and your cake looked like it would fit the bill. I made two ‘tests cakes’ this weekend. Here’s why – I found out that not all millet is the same. I usually buy my flours at my local Asian market because I can find what I need and I don’t have to mortgage my house to pay for it. Anyway, I picked up what said, “millet flour” on the package. It was a light tan colored flour. I baked the cake and while it tasted pretty good, it definitely wasn’t YELLOW. And yellow was what I was after if I was going to please the birthday girl. So, I made a trip to Whole Paycheck and picked up Bob’s Red Mill millet flour. I surmised right away that this was going to be the key as the flour was a sunny yellow color. The next cake was definitely yellow! The only change I made was to bump up the vanilla to 1T, since a very pronounced vanilla flavor is more like the dreaded Betty Crocker that the birthday girl loves. So, thank you! While I am quite pleased with my go-to GF cake mix (KAF) it only comes in chocolate. This recipe is it’s new companion. Wow, very interesting, Maggi! I guess I’ve only ever really used the yellow millet. Another thing (just as an fyi) that could affect the color of yellow cake is the eggs. Pastured eggs from the farmers’ market or good quality organic eggs will have deep orange yolks, which will help to give that bright yellow color. Either way, I’m so glad to hear that this recipe worked for you and that it yielded the truly yellow cake you were looking for.